This post is made possible in part by my Patreon supporters, for Rasmussen Travels for setting the trip up, and also by my gracious wedding guests. Thank you. Other than owing to the fact that this was my honeymoon, I overall enjoyed this trip. 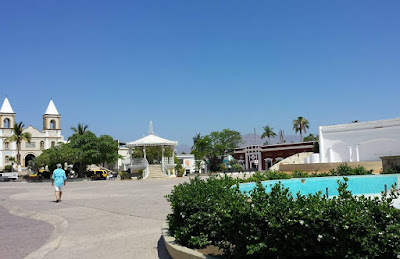 For lodging, we were given time as a wedding gift to stay at Villa del Arco resort. I am not one to stay at resorts (though I did enjoy a lot of the amenities there. Why would I not? ), so I took this opportunity to explore the localities around. While Cabo san Lucas itself is a city that caters to a more party, Spring Break like crowd, there was still a lot for us to enjoy. Los Cabos is the municipality (similar to counties here in the United States) in the state of Baja California Sur, and is located at the southern most tip of the Baja California peninsula. It is surrounded by the Pacific Ocean to the west and the Gulf of California to the east. The municipality contains the two cities of Cabo san Lucas and San José del Cabo (the municipality seat). It is where the Mexican desert meets the Sierra de la Laguna mountains meet where both the Pacific Ocean meets the Gulf of California. It all culminates in a beautiful arch of rock over the meeting of the waters, created by erosion over time. The Arch found at the end of the cape. Life stands still in Los Cabos. It is often too hot to go outdoors during the afternoon, so staying put and having a margarita is a very tempting part of the afternoon. If not, then taking a siesta and coming back out when it cools off considerably during the evening. However, there are a lot of touristy things to partake in, and usually water-based. 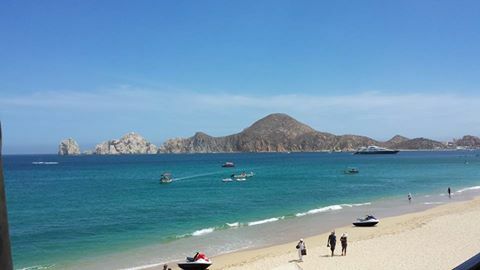 From the marina at Cabo, you can hope a tour boat for lunch and enjoy snorkeling and swimming with the fish amount the coral. For dinner, there is another tour boat, Caborey, from the same marina that brings you around the arch and Land's End, as it is called, where you get to enjoy a premium dinner while watching the sun set over the Pacific Ocean. There is also a beach that is on both the Gulf and the Ocean called Lover's Beach, called Divorce Beach on the Pacific side, and it is only obtainable by boat. Unfortunately for us, the seas were so choppy that week, that all the beaches, including Lover's Beach, was closed due to strong undertow. Sadface. As I stated above, Cabo definitely catered to the American tourist very well. Most people spoke English as well as Spanish, signs were in English, and the American dollar was often more accepted than the Mexican peso. I was actually disappointed about that. Granted, I do not speak Spanish very well, so I was grateful for the great amount of English speaking there, but I really prefer to see more local establishments instead of tourist traps. I honestly felt like I was at an American party city instead of visiting a Mexican city. With that said though, even beyond what was provided from the marina, I still enjoyed what I did there. 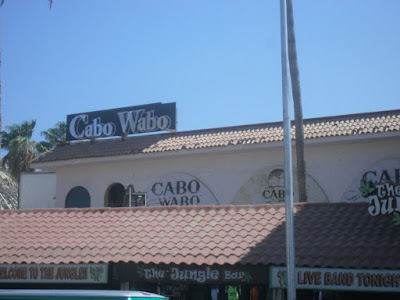 Any fan of Sammy Hagar will know that this is where Cabo Wabo, his bar that he opened with other Van Halen members, is located at. The food was delicious and of course the margaritas were amazing. They offer live music daily to enjoy when the sun goes down and the electric lights go up. Plus, the only microbrewery in Baja Mexico Sur, the Baja Brewing Company, has two locations in Cabo: the rooftop of Cabo Villas and on the marina. My recommendation: go to the rooftop, enjoy a cold one, and soak in the best view of the Gulf in all of Los Cabos. While I was disappointed in Cabo san Lucas for what I was looking for, I thoroughly enjoyed San José del Cabo. It is only a quick thirty minute drive up the highway, and it offered exactly what I was looking for. We were initially drawn there for a swim with dolphins at Dolphin Discovery, just outside of town. This was a place that I could see myself spending a lot of my remaining life, provided I can get used to the heat. Nordic family background and all. There was so much to see in such a small town, and everything was right off of, and centered around, the town square. Go to a pub called the Downtown Pub (yes, in English, but too small for a website), have a margarita made by Dominic, and let him tell you a story. For dinner, go up the hill and get fresh seafood from El Toro Güero (also, no website). In the evening, enjoy the many art and artisan shops surrounding the square. Bring pesos! While some shops will take the American dollar, most only take the local currency. If you are there on a Thursday evening, also take a stroll through the town art walk on the town square. The locals will bring their art to sell. Even though Cabo san Lucas itself disappointed me a little, I still loved Los Cabos. It was very beautiful and scenic, and I fell in love with San José del Cabo. I will definitely come back for more, and next time, I will remember to bring my party spirit to enjoy Cabo. This post is made possible in part by my Patreon supporters, for Rasmussen Travels for setting the trip up, also by my gracious wedding guests. Thank you. This is a continuation, start with Part I here or continue with Part II here. Today is our last day in Los Cabos, and tomorrow morning we fly back to Illinois. It has been a great trip, but I am satisfied to go back home (though maybe not back to work). Today we had a lazy day. We slept in, went to breakfast, and then spent most of the afternoon having cold margaritas at the bar. It was very relaxing sitting in the shade, drinking margaritas, and watching the waves run up the beach. The view of the gulf is beautiful enough that it is best to have a single day devoted to just enjoying that view. In the evening, we went back into the city one last night, and walked around the marina. 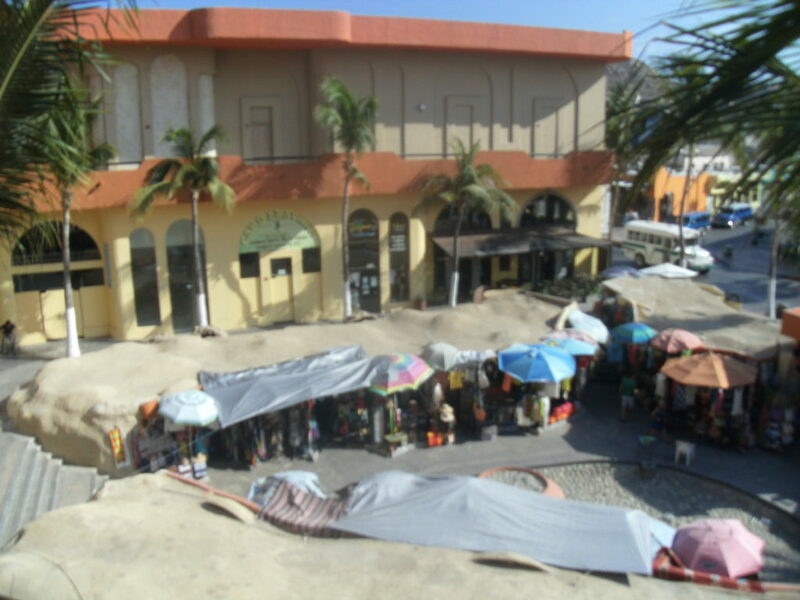 There were a lot of artisan vendors selling art or jewelry to the tourists or sailors/yacht owners that walk by, as well as another storefront for Baja Brewing Company. Interestingly enough, there was also a Hooters restaurant there. It takes about twenty minutes to walk from one end of the marina around to the other end. What brought us to the marina was a dinner cruise around the cape and the bay. It was a fantastic classy dinner and showcased traditional Mexican folk dancing and Argentinian tangos with view of the sunset over the waters. It was a beautiful end to a beautiful vacation. When I return home, I will write the usual summary of the trip, and share more of my impressions. Hey! A local magazine here has heard of my series! Check out their Tweet! This is a continuation of a series, start with Part I here. Yesterday (1 June 2016), we did a few more "touristy" things that we do not get the opportunity to imbibe in while living in the landlocked state of Illinois. We woke up, went to the beach, and rented a wave runner. We then took an hour riding the waves of the Gulf of California. After which, we left the resort and went back into the city. Here, we went to the marina, and took a lunch boat tour with snorkelling. I had never been snorkelling before, and this was a blast. The tour offered an open bar and a taco bar available after the snorkelling was over. While snorkelling, I got to see fish that I had never seen in person outside of the Shedd Aquarium. That was definitely a must-do for anyone visiting from a landlocked state such as myself. The Arch found at the end of the cape. This was formed from erosion, and is where the Gulf of California meets the Pacific Ocean. Doing more exploring in the city, I discovered a gem hidden by the beach: the Baja Brewing Company brewery. It has a full menu, and a variety of brews on tap. A fan of darker beers, I recommend the Baja Black while sitting on the upstairs balcony with a view of the Gulf. Today, we woke up and took a shuttle to San José del Cabo, and swam with the dolphins. If you have never done that, I recommend it at least once. Maybe even twice. It is a great family outing for the kids. From here, we explored the village of San José, and I immediately fell in love. Here, everything looks picturesque. The streets are cobblestone, the buildings are adobe, and the town square is shadowed by the local church. There were much less people comfortable speaking English here, so I had to try my very low Spanish skills. It was all very low key, chill, relaxing, and very enjoyable. Even the places I went to and enjoyed are too small to have a website for me to share. I shared this sentiment with the locals I met, and they agreed with me: Cabo is where you go to party; San José is where you go to enjoy culture. They even had a nickname for Cabo: the Mexican Las Vegas. There are art galleries, from traditional Mexican to modern lining the town square. Should you find yourself here, and I so hope that you do, go to the Downtown Pub, across the square from the church, and say hello to Dominic for me, pull up a bar stool, order a margarita, and let him tell you his story. Enjoy a fresh sea food meal from El Toro Güero, only five blocks off of the square. Walk up and down the square and chat with the locals. Visiting San José has been my favourite stop so far on this trip, and I want all to enjoy it, even for a day. 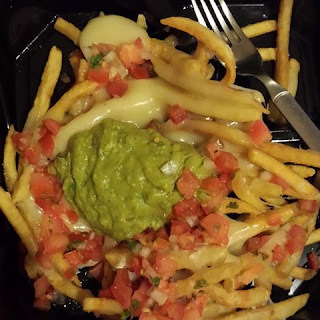 Of course, I found/made the "local" variant of poutine today. Simply replace the gravy with guacamole and pico de gallo! Tomorrow is my last day here in Cabo, and tomorrow evening will be my last post before my final summary when I return. Read Part III here. View of the end of the cape from the resort deck. We [my wife and I] landed safely yesterday (30 May 2016) and it was immediately a blast. After checking in at the resort we are staying at, and immediately went to the beach. Unfortunately, both today and yesterday, the authorities gave a strong undertow warning, so we could not do a whole lot of beach swimming. However, we still waded to about knee's deep, then took to the resort pool. However, after an hour, we went inside to get ready for dinner, and instead accidentally took a 14 hour "nap." After waking up the next morning as if Monday never really happened, we had breakfast, and then left the resort to go into the city. At first impression, the city definitely caters to its American tourists. It would be a place I recommend for Spring Break. Every other door is either a bar or a spa, while the other doors are either a pharmacy or a trinket shop. 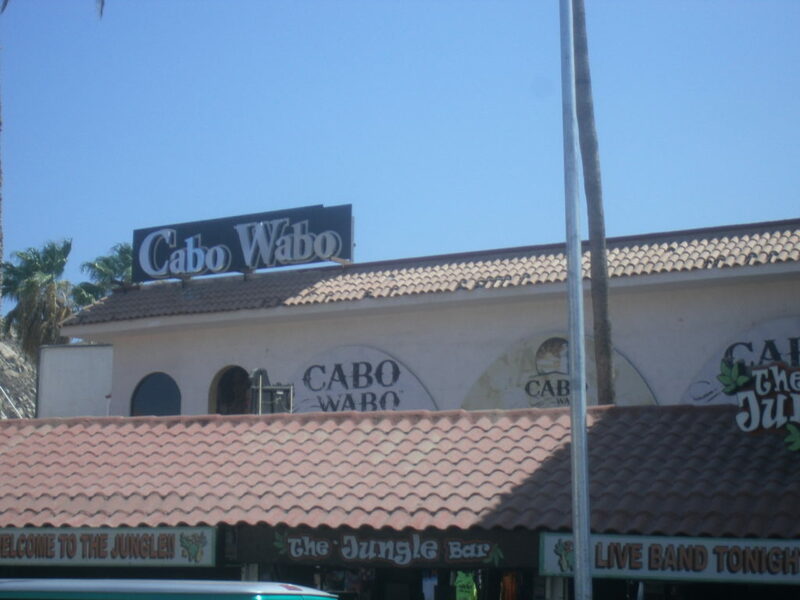 We stopped at Cabo Wabo, known most for being the bar opened by rock star Sammy Hagar, to have lunch and a couple margaritas. We were not disappointed. I recommend it to anyone visiting the Cantina to go at least once. The best part: live music almost every night. With my love of live music, I was definitely pleased. Cabo Wabo from the back. 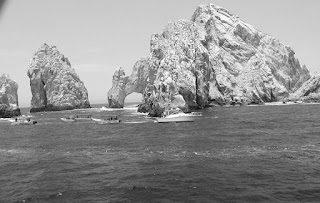 Tomorrow, we plan on doing more exploring of the city of Cabo san Lucas, snorkelling in the waters, jet skiing, and hopefully seeing the rock arch at the end of the cape. Please continue with us on this trip by heading to Part II.